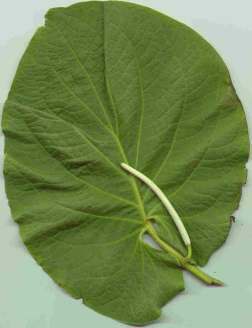 - Hoja Santa, Rootbeer Plant - An unusual perennial for shade. Can grow to over 10 feet high and spreads by underground stems. Requires supplemental irrigation and a deep mulch during our winters. A most unusual perennial for shade. It forms a clump of numerous cane-like shoots to over 10 feet high, spreading by underground stems. While it is not the true source of rootbeer,its leaves, if crushed, release the unique aroma of rootbeer. In the cuisine of southern Mexico, fish and fowl are sometimes wrapped in these leaves and baked. Because of its subtropical origins, it is best to apply a deep mulch (6 to 8 inches) in late fall for protection from hard freezes during our winters. Grows in shade to morning sun locations and requires more supplemental irrigation the more sun it receives. Looks best if given a deep watering every week during a dry summer.